You are here: Home / Renal Diabetic Diet / What Kidney Diet Should I Follow For 20% Kidney Function? How Do I Know What Kidney Diet To Follow? Your kidney diet prescription is closely related to your eGFR and your percentage kidney function. Your eGFR is the amount of creatinine that your kidneys are filtering through. The lower it is, the higher stage of kidney disease you have. As you can see from above, your eGFR is fairly close to how well your kidneys are functioning. If you have about 20% kidney function left, you are likely in stage 4 kidney disease, and needing to really stick to a low protein diet. You are probably feeling fatigued, trouble with sleeping, and stress. Man, are you feeling a lot of stress. The first things you need to focus on are getting your diet and your health manageable. 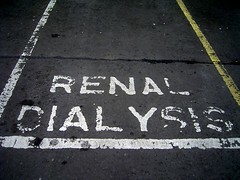 If your nephrologist is saying, prepare for dialysis, then you should take steps to prepare. If you are motivated to make the changes now to your kidney disease because you are not wanting to go on dialysis, then follow a healthy meal plan and start taking your medications that you are prescribed. You need to make sure your albumin levels are doing well, even though you may require a limited protein amount to keep your kidneys healthy. Albumin is a blood protein that is able to show doctors if you are healthy. Yours might be low, try to find out the number it is and where your nephrologist wants you to be. Then add some protein to your diet that comes in the form of vegetable and starches. You can add some quinoa or some noodles or rice. All of those contain additional protein but since it’s not animal protein it’s not as full of phosphorus and potassium. You are better off eating the vegetable and starch proteins than too much animal protein. Now, you should get some animal protein, just don’t over do it. Your kidneys are still failing. Try to reduce your stress. Sleep better and longer – most of us only get 5 or less hours per night – aim for taking care of yourself and go to bed early if you have to. Sleeping better also probably requires you turning off the TV at bedtime and going to sleep in a darkened room. You will find plenty of options for help with your dialysis diet, because Medicare reimbursement allows you to see a dietitian and get more help. You are pre-dialysis, and you need to know your diet and how you fit in. You are at a point of needing to seriously measure the amount of food that you eat if you want to stop your kidney disease progression. I’m not saying that you can stop it, but to have a chance you should control the amount of food you eat as far as protein is concerned. Stick to a plan of 40-60 gm of protein per day. That is only about 2 ounces of beef, pork or poultry per meal. That is not much. And limit your sodium. At this point you are making your meals at home. Bottom line, if you are serious about trying to slow down your kidney disease progression, you will need to get a predialysis meal plan and stick to it. It’s one of the best ways to make it through this rough time. Why did I not hear about this type of diet other than by my own research? I started out at mid-Stage 3 and I went to Stage Four and now I am starting to enter Stage 5. My doctor (a nephrologist here in VA) talks about weight loss and soidum restriction but has never mentioned the other parts of the diet nor has he referred me to a renal dietician, which my insurance would cover. He goes on about exercise but I have told him I usually am too tired to exercise. I might be able to swim if I could find a heated pool but I am stuck using public transportation and in my area finding a pool I can access with hours (weekends, after work on weekdays) I can attend seems impossible. I am 63, work full time (and many times OT!) and in addition have Hepatitis C and am plagued by Fibromyalgia. And I do not want to do dialysis. THE DR. JUST INFORMED ME THAT MY KIDNEY FUNCTION DROPPED 7 POINTS I’AM A 3-4 STAGE KIDNEY DISEASE. HE HAD TOLD ME THAT I COULD EAT ANYTHING EXCEPT HAMBURGER. NOW HE TELL’S ME NOT TO EAT PORK, HAM, HOT DOGS LUNCH MEAT. WATCH MY SALT AND DRINK MORE WATER. AS I DRINK TEA COFFEE, COLD ICE TEA SODA ONCE IN A WHILE SO I CAN HAVE SOMETHING DIFFERENT. I REALLY DO NOT KNOW WHAT TO EAT OR DRINK, AS I’VE BEEN EATING A LOT OF PROCESSED FOOD. I’M BESIDE MYSELF. CAN YOU PLEASE HELP.